In this part of the world we mislaid some of our traditions (we did not lose them, but just forgot where we put them) and so we have often looked to our neighbours in other parts of the world to remind us of them. This is a valuable thing - when our fires go out we ask our neighbours for some embers to relight them, but then we can keep our fires going rather than repeatedly returning for more embers. So much of the way in which smudging and smoking is practiced in this part of the world now is borrowed from the Native American traditions. The most widely used plant at present tends to be white sage or sagebrush (Artemisia tridentata/ ludovciana) which is native to Northern America. In this tradition smudging sticks and herbs were never sold but rather given as gifts. However, in most cultures throughout the world smoke, smudge, and incense would have formed part of ritual and ritual was seen as part of the sacred ordinary and ordinary sacredness. Smoke was used as an offering to the deities and the sacred, for meditation and ritual, to cleanse animals (including the human ones) and make them healthy, for fumigation and space clearing, to preserve food and in some places squatting over smoke was used cleanse and repair the womb after childbirth. The amount of ritual and complexity for preparation of plants for smoking varied from place to place; in ancient Egypt there were very complex recipes and formulae for creating incenses, as there continue to be in places such as India, Nepal and Japan where burning incense is seen as an important part of spiritual rituals. Amongst the European peasant cultures smokes and smudges often had more practical applications in the sacred ordinary to ensure the clearing of parasites and bugs from domestic animals and to clear ‘bad air’. Fumigation by smoke would also have been performed as a medicinal practice. In France rosemary and thyme were burned in hospitals as a way of keeping the air clean and preventing contagion. Smoking mixtures were widely used for the treatment of asthma and respiratory problems by burning on charcoal or using pipes or rolled into cigarettes. Smoking with herbs was deemed to relax a tight chest and relieve night wheezes and asthma. The herbs would be sprinkled on charcoal or onto a fire or barbecue. Here are some brief notes on a few that will grow in Ireland well; they are all native except rosemary and sage but these have be grown here for so long they are not really blow-ins anymore. Juniper is calming, protective and clears out negative energy. It also helps ward of viral infections and airborne illness. It can be grown easily. Pine is grounding, cleansing, urifying and helps to bring forgiveness. It helps to deepen the breathing and clear phlegm and strengthen the adrenal glands. Our native pine is a tall tree but one can grow smaller varieties of pine or spruce in the garden in containers. Mugwort is a native plant and its Scientific name is Artemisia. It is considered to be a messenger plant, helping us connect with nature, protective and helping lucid dreaming. It is especially cleansing and used to treat parasites and for menstrual inbalance and is a wayside journeying plant. Vervain is a native plant that is used for balance, repairing fragmentation, inner strength and peace. It is a tonifying nervine which works on the liver and heart and digestion. Bay is not a native but many people grow it in their garden. It is seen as a guardian plant that wards of illness and is traditionally used to make wreaths for champions. Sage is not a native but grows really well in our climate. It is associated with clearing, cleansing,fertility, healing, wisdom, mental clarity and longevity. Rosemary is not a native either and needs to be planted in dry soil. It. also strengthens the memory, helps with energy flow, binds the soul into the body, promotes fidelity and protects space. It also protects against airborne pathogens. Thyme protects against airborne pathogens too and is often combined with Rosemary. It promotes courage and confidence and lifts heavy moods, brining an increase in energy and vitality. In Europe plants that were traditionally used in smoke purification included vervain, mugwort, pine and juniper. Often herbs were dried as loose leaf and burned on charcoal or thrown onto fires; vervain and mugwort work better dried as looose leaves. For pine and juniper small branchlets can be dried and used as smudge sticks. Rosemary also works well this way. To make smudge bundles the best herb to use is garden sage (Salvia officinalis) although other herbs such as thyme, and lavender and mugwort can be included in the bundles. You may choose to grow particular plants in your garden specifically to use for smudge or to collect them from the wild. Before harvesting set your intention and sit a while with the plant to ask permission to harvest part of it and use it for this purpose. Make sure to harvest respectfully not taking too much of the plant, and to use strong healthy plant material. 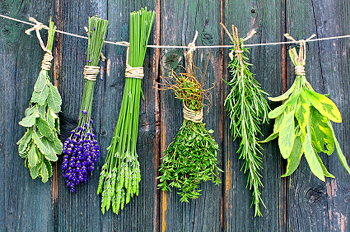 You may choose to wilt the herbs for a day before tying them or simply tie them fresh. I prefer a simple ritual prayer to be offered before harvesting and tying the bundles; Give thanks to the plants and the Earth for the abundance around us, take a moment to clear the heart and work from pure innocent intention and if the smudge is being used for clearing a group space ask that it will be good medicine for this, or if it is to be used personally put this into the intention. And remember to give thanks after harvesting and whilst making the bundles, gratitude is a great balm.